Is wearable tech really the next big thing? It’s hard to believe all the talk when it’s so rare to actually see any out on the streets. But all this could be about to change thanks to Hosain Rahman, co-founder of Jawbone. 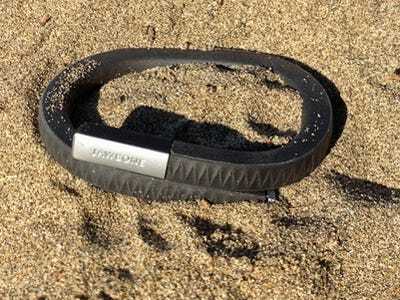 The company pioneered noise-cancelling technology for the US military before bringing their Bluetooth headset to market, and now the Jawbone UP wristband is revolutionising healthcare for its handful of users around the world. What makes Rahman think he can get the UP onto more wrists, and what else has he got up his sleeve? UP works by tracking your activity throughout your day and providing observations and tips based on the data it collects. It lets you set step targets and monitors your sleeping habits to help you stay more active during the day and get more rest at night. If that’s too creepy for you, you won’t like this. UP can also be used with a whole host of other apps and devices, such as a caffeine counter that helps you keep track of arousal levels, and Nest, the smart thermostat that adjusts the temperature in your home when you go to sleep and wake up based on signals from your wristband. This might sound like the rise of the machines, but plenty of people are reporting healthier lifestyles as a result of using UP. Jawbone has also gleaned some amazing insights from their users’ data, which is sure to open some eyes to our entrenched lifestyle habits. And there’s no reason for the developments to stop here. As the technology gets more sophisticated, it’s feasible that doctors could start prescribing wearable tech to help monitor health conditions and medicine dosage. What makes the UP such an appealing piece of kit is its design. Rahman is quite clear about this: “good design is about taking good care of your customers. When you take good care of your customers that’s ultimately the best thing you can do for business.” With its simple shape and choice of colours, the UP band could be a watch or campaign bracelet at first glance. And its lack of a screen gives it an unobtrusive way in to our everyday lives – it doesn’t impose itself as a brash or flashy new gadget to be checked hundreds of times a day. This unobtrusiveness gives the UP a good chance of competing with other wearables like Samsung’s smartwatches and Google Glass, which push screens ever closer to our faces. By keeping function and style simple, Rahman has allowed his product to cut through all the hype surrounding these other products. Jawbone has made wearable tech desirable in a way that few other companies have. Some might say their only real design rival is Apple – a link that can be traced back to Apple’s former head of marketing, Allison Johnson, who now works for Jawbone. The company’s real achievement is making wearable tech less scary. Yes, UP knows when you’re sleeping. It knows when you’re awake. It knows when you’ve been bad or good (in terms of food, at least). But the friendly face of Jawbone, carefully brought about over the last 15 years by Hosain Rahman, might just convince people that the next generation of technology is not here to rule us – it’s here to help.